How many people lived during the 20th century? How many people died during the 20th century? All of us have, at one time or another, suffered the misfortune of being born.2 As such, we can answer the first of Dr. Pinker's questions by knowing what the population was at midnight on New Year's Eve 1899 and adding to that any births that occurred during the next one hundred years. The first of these is easy to look up (about 1.6 billion), and I'll discuss the latter shortly. Before getting to that though, I should point out that once you have this answer, the answer to the second question is easy to find. Since another unfortunate consequence of birth is, of course, the inevitable death that follows, all you have to do is subtract the world population at midnight on New Year's Eve 1999 (about 6 billion) from the number of people who "lived in the 20th century" and you'll have found the number of people who croaked during this time. The only tricky step is figuring out how many people were born in the meantime. 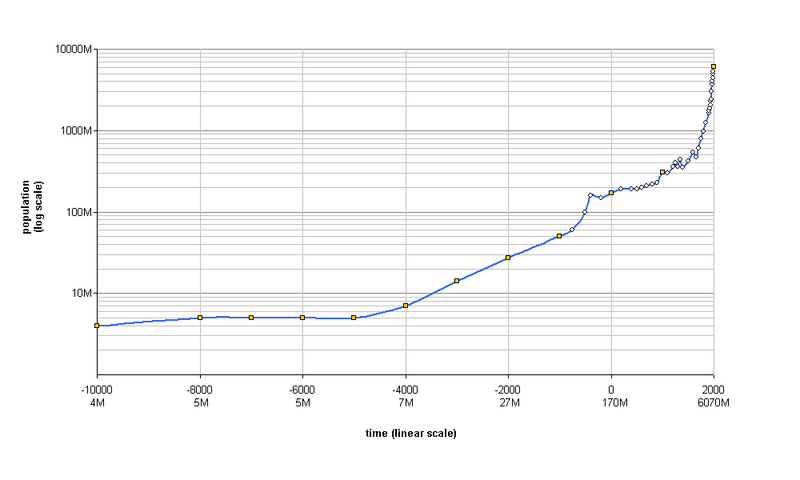 A nice "world population vs. time" plot courtesy of Wikipedia. Dr. Pinker, it has been an honor having you and your awesome hair on the blog today. Thanks for a great question! To quote the Improbably Research website, "From that lone, Pinkerian seed, there has grown a spreading chestnut, black, blond, and red-haired membership tree." Birth is, of course, a vital prerequisite for living, but that fact does not make the matter any more pleasant or less messy. The exact number might be closer to 2.1 kids or 3.1 kids. Fortunately, most of us aren't the Duggars, so we should be good to at least an order of magnitude here. For those who have a hard time seeing why it's 2.15 and not just 2.3, consider a world with only 20 people. If those people reproduce at the assumed rate, they will have 23 kids giving a total population of 43 people, or roughly 2.15 times the original population. This means that roughly 18% of the people who were alive at some point during the 20th century were alive at the end of it. Avid readers of this blog will note that one of the first calculations I did was determining what fraction of people that have ever lived are still living. I got about 30%, but a more reasonable number is 6%. I'll leave it as a challenge for you to figure out why that's still not a bad estimate in light of today's result. How about wealth created during that time? I suspect that would show that increasing population hasn't had a negative impact on wealth-creation (or, indeed, health or longevity). I'm sorry but your calculation is hopelessly inaccurate. 2.15^4 × (1.6 billion) assumes the average person is indefinitely fertile, and reproduces every 25 years without dying (until the year 2000). If we keep with the discrete 25-year generation you propose, and assume a constant fertility over the last 100 years, the successive generations form a geometric series. Let's say if this generation has x fertile (< 25 yr old) people, that the next generation consist of x*m fertile (< 25-yr old) people. Let's assume the fertile population in 1900 is "p". Let's also assume that a given generation basically dies out after 75 years. This is a realistic life expectancy. In 1900 the world population was then the sum of the generations of 1850 - 1900. Older people were all dead. We also know that the world population was, at that time, 1.6 bn. Therefore p/m^2 + p/m + p = 1.6 bn. Therefore p*m^2 + p*m^3 + p*m^4 = 6.9 bn. Now we have 2 equations and 2 unknowns, and we can solve p and m.
p + p*m + p*m^2 = 3.3 bn. Looking at the graph it's a little high, but reasonable. Hey, this is a very rough approximation (the effects of 2 world wars and the invention of antibiotics surely makes is much more difficult to model). Now look at the final numbers. The total number of people who have lived at some time in the 20th century becomes p * (1/m^2 + 1/m + 1 + m + m^2 + m^3 + m^4) = 9.56 bn. Which means that there were only approximately 2.7 bn deaths in the 20th century! Yeah, that's a fair critique. I like your method better. Though I would argue that your description of it as "hopelessly inaccurate" is a bit overly dramatic considering it's an order-of-magnitude estimate, which is only intended to be good to within roughly a power of ten. Yes my wording was a bit dramatic, but my estimate (which is the best I can think of given my limited knowledge) does differ by slightly *more* than one order of magnitude. That's a big difference when guessing populations. The earth currently has a population of 50 billion, accurate to within 1 order of magnitude. But that is a very very wrong number with which one can get to very wrong conclusions. For example, I propose that there are more than twice as many people currently alive on earth than all the people who died during the 20th century. your former analysis would say - no, there are only about a quarter as many. Take the world's population, and kill them 4 times over. That is how many people died in the 20th century. Steven Pinker himself tweeted this, and that caught my attention. Since we actually have pretty good records of human population we can do a lot better than an order of magnitude guess. But sorry if you became the victim of a famous tweet. From Steven Pinker I expected more accurate guesstimates. It was interesting and got me thinking - thanks for that. It's all good. The inaccuracy is purely my own, not Pinker's. I only ask guests to supply questions, so it's not their fault in my answers are off. I do like your method. In fact, I may use it for a problem I'll be posting later this week. Feel free comment again if you find something I write innaccurate or a bit misleading.